Sega's beloved Phantasy Star Online series is coming back to gamers, and the company's let out some details to tantalize its fans with. 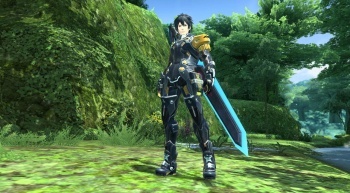 Fans of Phantasy Star Online were heartbroken when Sega announced that it was shutting down the game's servers a little over a year ago. Now, however, Sega has started teasing out details for Phantasy Star Online 2, including some mighty pretty screenshots. The ship fleet Oracle (written in Japanese, "オラクル") which travels the endless stars. A new adventure that awaits on the countless planets. Invasion of the malice that covers the universe. The name of the people who face off against them is Arcs (in Japanese, "アークス"). Will the universe be saved, or will it be swallowed up? It's in the hands of the hero (you). The above is just a super quick translation of 4Gamer's summary. 4Gamer said that it might have made some errors in its transcript. Is there adventure in today's RPGs? â€¢ Always, to a new field. Random field. â€¢ It gives you a foreboding feeling -- seamless weather. â€¢ Aiming for "Endless Advneture." â€¢ The adventure without end, once again. You can see all the graphics, in high-resolution over at Andriasang, and the video footage, too. This new Phantasy Star is reportedly in alpha testing right now and will (possibly) be released for the PC later this year.